Certain moments in the history of art are formed by institutional processes of recovery of unique subjects that can come to define an entire generation of artists or even the cultural production of a territory. In the Brazilian case, Helio Oiticica and Ligya Clark exemplify this phenomenon, since they have been widely used since the end of the nineties as “pillars” to reflect upon a large portion of the contemporary Brazilian art productions. However, the same matrix that supports the work of these artists was also shared by many others, generating several experiments that now deserve to be revisited. The old separation between a “hard edge” Concretism from São Paulo against a more “counter cultural and organic” (Neo) Concretism from Rio de Janeiro may have no longer the defining force as a boundary between opposed branches of art in Brazil. They rather may be understood as specific and complementary parts of a modernization drive, each one linked to their own places and times of emergence, as kinds of answers to and echoes of what was pulsating as cultural and also as social needs. It is from this point of view that the new exhibition focused on the work of Geraldo de Barros (Chavantes, 1923 – São Paulo, 1998) can claim our attention. Entitled “Geraldo Industrial” and created for Luciana Brito Gallery by the artists Fabiana and Lenora de Barros (daughters of Geraldo), the show traces a small panorama of the production of this prolific and controversial artist. 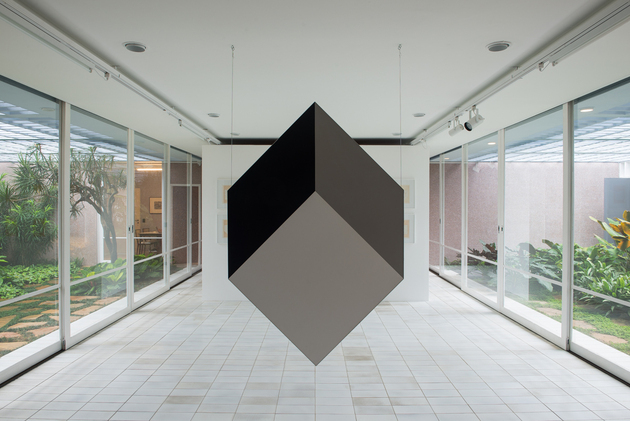 It is also the first time, since the change of venue of Luciana Brito Gallery, that a single artist occupies all of the gallery’s new exhibition spaces, now located at a recovered modernist house designed by the remarkable architect Rivo Levi. Featuring iconic works, paints and preparatory drawings related to a series made in the eighties (part of which are in the Inhotim collection), the show presents a view of a practice that transited between painting, photography and design, making evident the multifaceted character of the artist, who was one of the precursors of Concrete Art in Brazil. 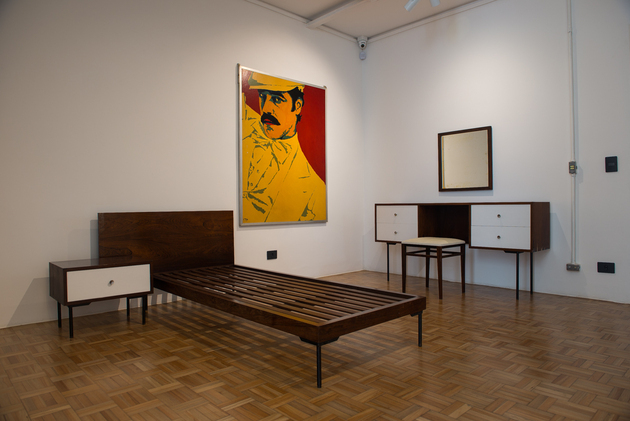 In some of the exhibition spaces of the gallery, we can also see the reconstructions of rooms whose furniture are designs by the artist, dating back to his years of work in front of the factories of Unilabor (1954-1961) and HObJEto (1964-1989). Particularly interesting, Unilabor is a unique early experiment in Bauhaus style: from 1954 to 1961 he set together with a Dominican Priest the “Unilabor community,” outlining a cooperative and communitarian experiment of modern production. Unilabor was one of the first brands in modern furniture design in São Paulo and its social efforts became also well renowned. 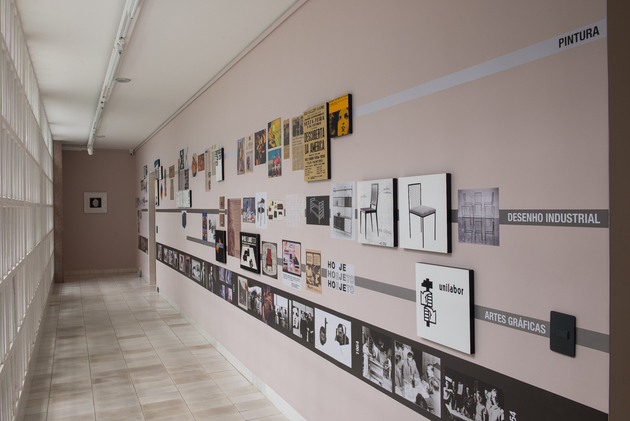 Another important feature in the show is a timeline in which one can follow the developments in the artist’s career as also to connect his diverse productions with each other and to other external episodes of his practice. This timeline could have been installed in a different place within the show, as it seems a very important part (if not a key narrative element) to understand the historical involvements of Barros within the local cultural enterprises. In this direction, it seems important to point out that the artistic trajectory of Barros is also intertwined in the very process of modernization of Brazilian art. At the age of twenty-six, he participated in the creation of the laboratory and photography course at the São Paulo Museum of Art (MASP), where he presented the solo show “Fotoformas” (1950). 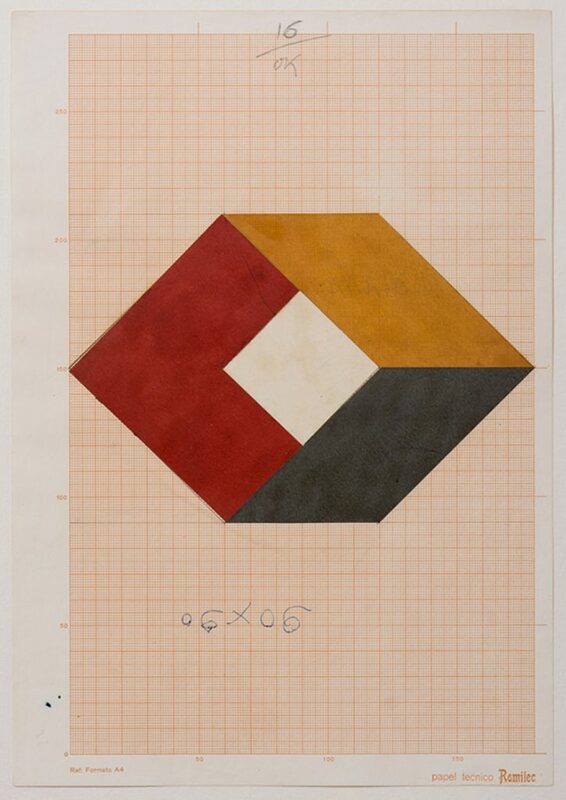 Through this contact with MASP and with its director, Pietro Maria Bardi, Geraldo earned a scholarship and departed in 1951 to study with Max Bill at the HfG – Hoschule für Gestaltung (School of Forms) in Ulm, Germany. Upon his return, Barros became a key figure in the avant-garde artistic movements of São Paulo, as one of the founders of the groups Ruptura (1952) and Rex (1966)—both radical collective experiments that defied the status quo as they also defined diverse transformations in the field of art—which were both essential and influential to the movements that would allow the emergence of a next generation of art experiments, such as of Oiticica and Clark. Geraldo was also a widely recognized artist during his life, having participated in the I, II, IX, XV and XXI Biennials of São Paulo and the Venice Biennale in 1986. His works are include in several collections, such as Ludwig Museum, Max Bill Foundation, São Paulo Museum of Contemporary Art, São Paulo Museum of Art, São Paulo Museum of Modern Art and the MoMA, New York. Alongside other concrete artists, who were focused on experimentalism (such as Waldemar Cordeiro), Barros sought the articulation of art in sociocultural processes that are critical and inventive in face of the technological as also to the social developments of his own time. Attaching art to the everyday, whether through design or employing non-artistic and industrial process of production (for example in in the making of “painting-formics” which can make a reference to the early “phone paintings” by Moholy Nagy), or in his black-and-white photographic experiments and montages, Geraldo fulfilled the modern impetus of socializing the forms of art, in elements both sensitive and functional. In addition to allowing an introduction to the artist’s broader trajectory, the show “Geraldo Industrial” reminds us of the potential of art to unfold in the most different contexts, fulfilling diverse functions, be them productive, sensible or radical.